Summer Celebrations 10% Off For One Week Only! Hooray, hooray, its the first day of May! 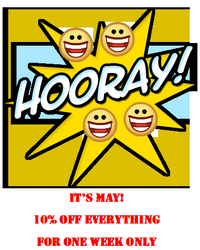 To celebrate the beginning of Summer 2013 we have decided to offer you 10% Off our entire product range for one week only. With over 250 products to choose it is well worth a browse! Check out our 2013 gardening tips or look at our wide range of energy saving outdoor lighting solutions or why not simply check out the purchase.ie range of gift ideas. The Electric Instant Hot Water Tap : Is the element for heating the water as it passes through the tap situated inside the appliance or is there another appliance needed ? What is the life expectancy of this & what is the warranty/guarrentee ? The element is inside the tap. Nothing else needed. Life expectancy of the element is 3 to7 Years dependent on usage and water quality.